Chariot, the commuter shuttle company that can transport up to 14 people at a time, just launched a new service for people who work in San Francisco’s residential neighborhoods and may need to get back to a BART stop or Caltrain station at night. “Now, we’re going to be able to serve a whole new swath of customers,” Chariot CEO Ali Vahabzadeh told me, like firefighters in the Presidio, school teachers in Pacific Heights, hospitality workers, workers at the Jewish Community Center, people who work in the Mission district. Chariot, which costs about $4 per trip, has 6,000 monthly riders and does about 4,000 rides a day across its 13 original commuter routes. Up until now, Chariot had been driving in the mornings from residential districts to downtown, and returning from downtown to residential neighborhoods empty. While the current offering includes fixed routes with fixed stops downtown, Chariot’s “dead-head” product lets you get dropped off in a white or yellow loading zone located as close to your final destination as possible. Chariot Direct is restricted to four drop-offs per trip, which the service determines based on the specific end points riders input. To be clear, the fixed pickup spots for Chariot Direct are the same as the ones in the standard service. I wondered if Chariot Direct might mean that people waiting for a Chariot downtown after work would have to wait longer to get picked up, but Vahabzadeh said that it shouldn’t be a problem. Chariot positions itself as a flexible mass transit service that falls somewhere in between public transportation and Uber/Lyft. The service is currently only live in San Francisco, but plans to launch in a second city this September and a third city later this year. 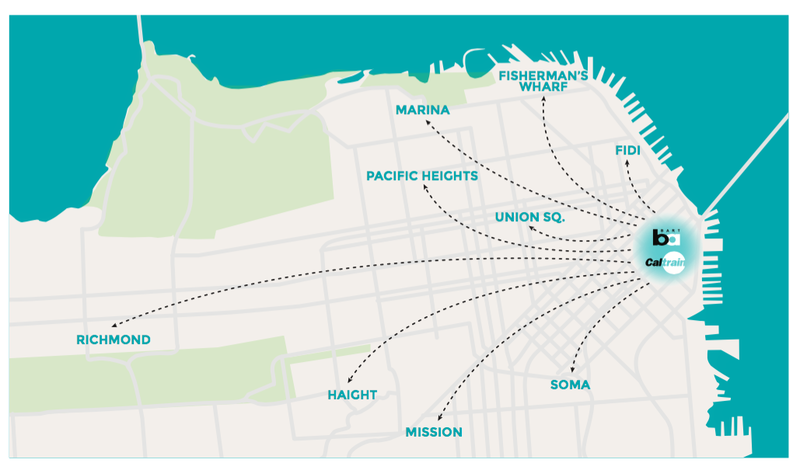 Chariot is also in early talks with the city of San Francisco to officially supplement public mass transit with Chariot’s flexible mass transit.